Robin and the girls are on vacation in San Diego. 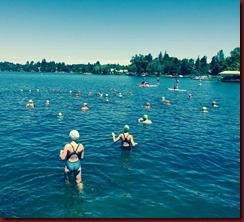 Dave Campbell told me about the Lake Swim happening in Lake of the Pines where my sister lives. A great opportunity for a visit and a swim! I leave church a little early concerned about missing the swim registration which supposedly ends in 15min! The funny thing is that the sermon was on not being anxious which is important for me to here. 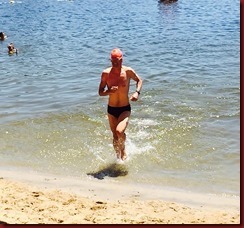 I was a little bit anxious and then arrived with plenty of time to spare because the swim was delayed. Never be anxious, just give it all to the Lord. It's ok to hurry, I just need to do it with a smile and a calm heart. It's terrific to see my sister and her daughters, Mariah and Jessica at the starting line! And then my mom and her husband, Ray, arrived, too! And my Junior High youth group leaders Chris and Gary. And quite a few other friends, too, like Caryn and Suzanne from Christian Encounters Ministries. It's a straight swim from the far shore to the beach at the country club. You can see the finish arch from the beginning. .83mi. 4 buoys. No wetsuit. Water is warm. 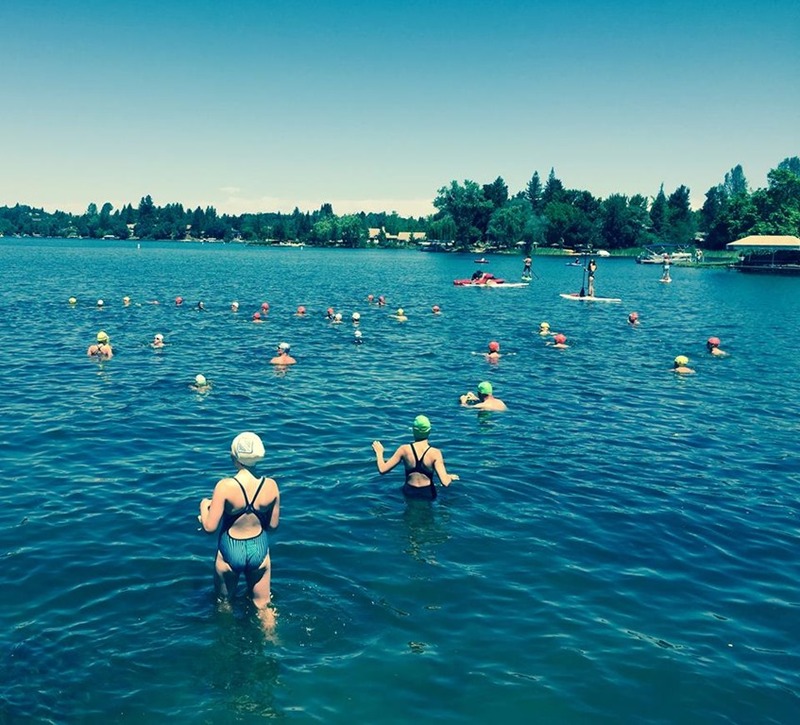 About 85 swimmers of ALL ages are smiling and ready. Go! Start goes well and for now actually ahead of Dave. But can I hold this. The time to the 1st buoy seems to take forever. 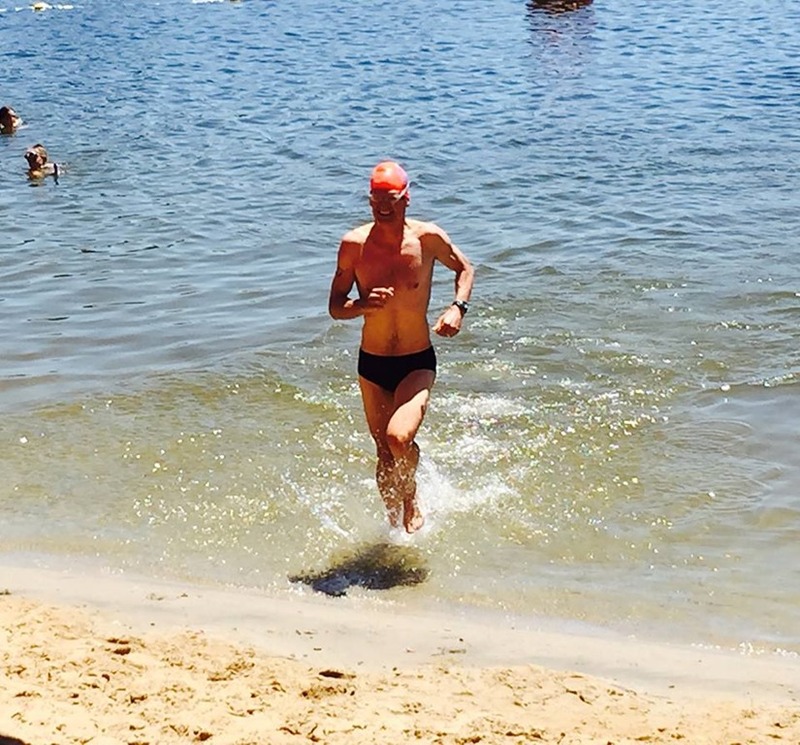 I'm trying to reach farther out in my stroke and also to keep my kick high in the water. Less drag as possible. It's a beautiful lake and surroundings. But with fogging goggles and breathing so hard, it's hard to enjoy it. I do notice the kayakers and paddle boards near me, guiding and protecting the swimmers. I think there's only 3 or 4 ahead of me which is surprising. I'm not planning on placing but hope to do my best. The 1st buoy felt like only 1/2 way, but after the next buoy it's going by a lot faster. I stop and rinse my goggles. Ah! Now I can see the beautiful surroundings better. But also focussed on going FAST. I try to keep a very straight line. My energy is staying strong, it's going well. Here comes the beach. I'm really tired now but I know I've got to attempt a run up to the arch for the final time check. Up, high-step, and across.. whew! done. I was 2nd in the 40 and older. 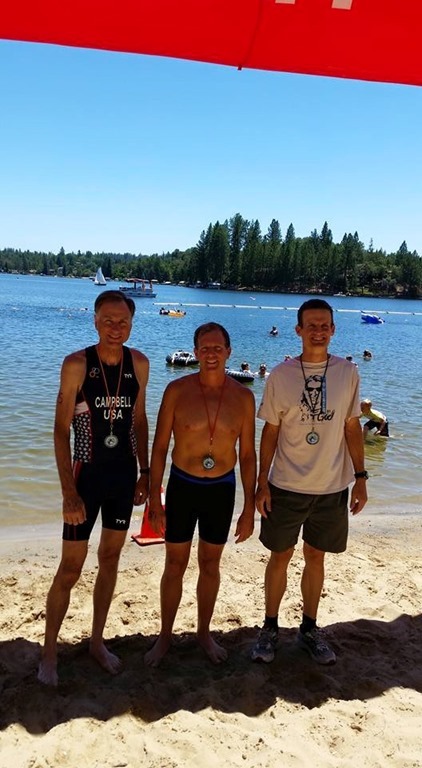 Well behind masters winner Jim Silk and just ahead of amazing triathlete, Dave Campbell, who I have quite an age advantage on. It was a great day and loved spending time with my sister's family and my mom and Ray. God is good.